Ah, it’s so good to leave LIC for a bit, since Sunnyside is only 2 stops away…what a beautiful day! I’ve been to I love Paraguay once several months ago, during the bleak midwinter; their Thursday special of beef and bean soup (Kumanda So’o) was wonderful. 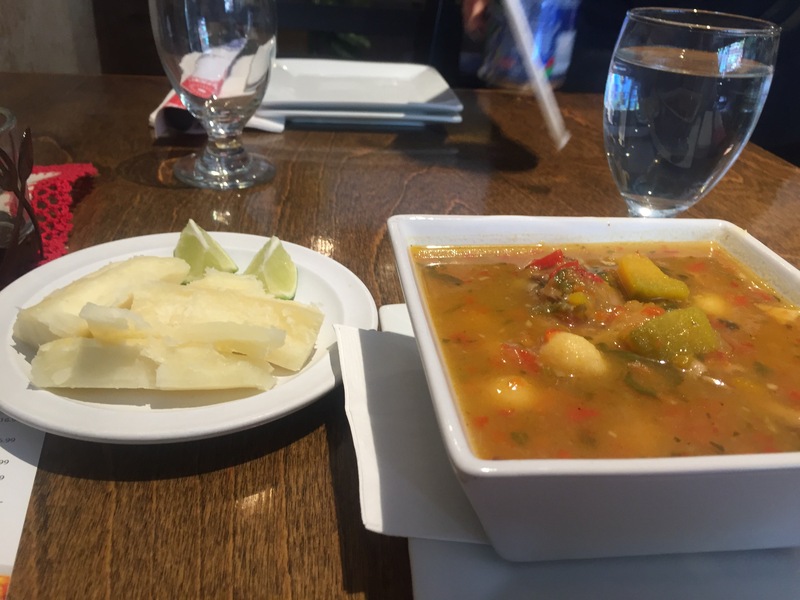 Today is Tuesday; their soup special is Caldo de Pollo con Vori Vori = Chicken soup with corn balls, served with a side of boiled yuca root, (or cassava? ), with lime wedges. The soup ($8.50) is rich and thick, spicy. A single, boiled chicken leg with the skin still on it floated on top; the corn balls vying for attention underneath, along with red pepper, onions, winter squash, and herbs. Yuca has no taste of its own; the texture is reminiscent of a potato, very starchy. You will need the limes. Next time, I plan to bring a friend, and try out the empanadas and their bakery items.